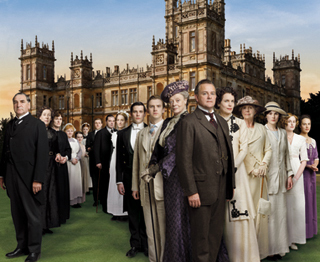 Enjoying the Downton Abbey Season 1 encore on Friday nights at 9? We are, too! We're also planning a Downton Abbey "marathon" for Thanksgiving weekend that will bundle seasons one and two (scroll down to see the info, below). Rhode Island PBS will host a public screening of the first hour of Masterpiece Downton Abbey's new season at the Park Theatre, 848 Park Avenue Cranston, RI, on Thursday, January 3. But the real fun begins at the Masterpiece Downton Abbey Season 3 Pre-Screening Party at 6:30 P.M.
For a contribution of $75 or more to support programming on WSBE Rhode Island PBS and Learn, you and a guest can party with us in the upstairs lounge of the historic Park Theatre. Light refreshments and cash bar will be available. Brush up on your Downton Abbey facts - your correct answers could mean fun prizes in the trivia contest! For added fun and glamour, come dressed as your favorite Downton Abbey character - the fashions in the three seasons so far span the late Edwardian period (think "Titanic" style) to the Roaring '20s (think "flapper" style). Then at 7:30 P.M., move into the luxury and comfort of your V.I.P seating in the beautifully restored theatre for the public screening of the first hour of Downton Abbey's new season - before it airs on U.S. television! 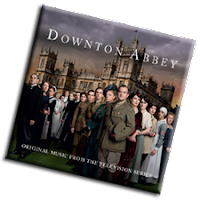 Plus, for your $75 contribution, you will also receive the official Downton Abbey soundtrack CD with our thanks. Season 1 Friday, November 23 from noon - 6 P.M. Season 2 Saturday, November 24 from 3 P.M. - 8 P.M.
concluding Sunday, November 25, 3 P.M. - 8 P.M. Bonus! Downton Abbey Revisited Sunday, Nov. 25 at 8 P.M. Season 3 premieres on Rhode Island PBS on Friday, January 18, 2013 at 9 P.M.